Castbars are able to be placed anywhere on the screen. Individual scaling of each castbar. Individual scaling of each castbar's text. Possible to offset the text's Y position. Tweaked graphics of the castbars. 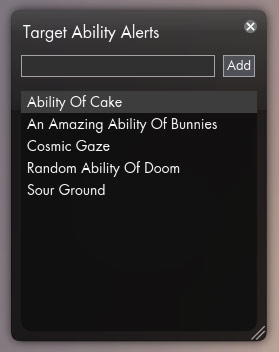 Alert system for specific abilities (user defined). The text from the dodge bar has been removed (you know what it does from the colour). Click the icon to the right of the compass to open the settings window and allow for the bars to be moved. Click the icon while holding down Ctrl to open the Target Ability Alert system window. If you Ctrl + click a castbar it will center horizontally on the screen. If you hold down Shift while moving a castbar it will lock its movement to the axis it moved the longest on. Basically it means that if you moved it up further than you moved it to the side, it will snap into the X position it was at when you started moving it, once you release the mouse button (while still holding Shift). Also if you Shift + click the icon the castbars will get reset to their default positions (default for this add-on, which is the same placement used in version 1.0.0). Fixed Target Ability Alert being broken in 2.1.4. Changed the text for the castbars to use HTML rendering as the Quantum Brace has its ability names formatted as such. The TAA window should no longer fail to load correctly. When moving the bars and holding down shift they now lock while moving and not just when you release the mouse. Right clicking on a bar will reset it to its default position. Fixed a bug with ability alerts with repeating alerts not triggering. Please note: If you use this together with the new Add-on Manager in Topbar Information Overload you will have to slot the icon into position before it shows up. You do this through the Add-on Manager by Shift + clicking Castbar Relocator in the list and assigning it a slot. Possible to open the settings window using the /vcr slash command (assuming you also install the script - check the readme.txt). 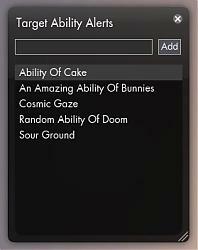 The Target Ability Alert window can now be opened from the settings window. 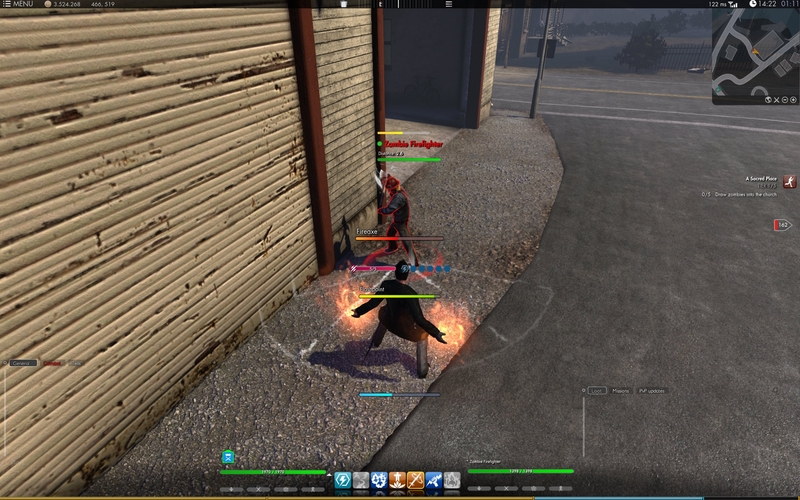 Added Target Ability Alert system. Removed debug text which accidently got left in. Fixed centering of the cast bars when scaling. The settings window now remembers its position. Castbars can now be placed anywhere on the screen. Each castbar can be scaled individually. Each castbar's text can be scaled individually. Each castbar's text can be offset on the Y axis. Tweaked the graphics of all castbars. Added icon for opening settings window (to the right of the compass). Helpers for moving/placing the castbars. Hover over the icon in-game to read how they work. Same here, no icon thus cannot change any settings. It looks like the graphics castbar graphics are different, though. Are you using my Topbar Information Overload as well? In that case it needs to be slotted first (unless you're using the newest version of TIO and that should happen automatically). Hi, any ideas why I dont have the icon beside the compass, thanks. Do you get the new castbar graphics and just not the icon? Yeah, I got the graphics but not the icon. I don't have anything that affects the compass (no addon for it, that I know of) but I was assuming it was TeamUI since that seems to be the commonality so far. Just not sure. I'm going to double check the two xml's that need to be updated, I think. Tried this mod for the first time in a while. Been using CustomUI. So I removed the castbar info from my CustomUi script for player, target and dodge. I adjust/resize/move the castbars with Castbar Relocator and the settings do not save and castbars are not showing up at all. I've tried /reloadui, /camp, etc. I'm sure its something with both mods trying to take control, but not sure if its an easy fix. Viper, just a FYI, you can make console commands for the Options, instead or rather, with the button as well. Read his directions, as you can use his '/option [variable] [value]' to see that it can be done. I removed the TeamUI flash and now I get the button. Def something mixing up the two, somehow. Well, yes - but it's a mess and not like making /vcr, for instance, to open the settings window for this add-on. First I love this and all of your other mods, thank you for contributing your time and effort in putting these together. Using castbar relocator i'm encountering a issue with the abilities used by the target showing up in a list on the top left corner of my screen. This is where I keep my chatbox so it is overlapping that and is thus a little annoying. 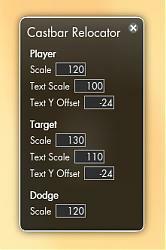 Removing the targetcastbar .swf stops this from occurring but leaves me with a yellow target castbar. just wondering if anyone else is having this issue or if there is a way to stop it other then the above. New version tomorrow (with new features), so I hope you'll survive until then. Last edited by Kharzon : 07-27-2012 at 05:08 PM. Viper, how did you get the resource counter in the centre of the screen? Last edited by Kharzon : 07-24-2012 at 07:18 PM. So, I'm also using the TeamUI addon, which for some reason, keeps me from having the button next to the compass or the Castbar Relocator, or maybe it's your other addon for the Information bar up top, I'm not sure. Is there a / command for the chat box that we can use to bring up the settings window? If not, pretty worthless ui for me to be using. Just trying all options before I get rid of it. Sadly it's not currently possible for us to do slash commands (at least nobody has figured out how, but it looks impossible). The TeamUI add-on should not have any influence on the icon. My Topbar Information Overload add-on won't either. The icon actually puts itself next to the compass, which isn't even part of the top bar (it exists on its own, just on top of the topbar). Last edited by Kharzon : 07-24-2012 at 04:57 PM. Patch 1.0.3 tomorrow should solve some issues at least as we're back to normal behaviour for add-ons again. If it still doesn't work you should re-check your XML files as that's where the problem is likely to be. Make sure to read the readme.txt I included as I contains a few extra instructions for upgrading this add-on to version 2+ (if you used version 1.0.0 before). Re: THANKS, VIPER!! YOU ROCK!! Mercinova: I might consider doing what you suggest, but right now I have to down-prioritise it as I doubt it's something the large majority wants. But in the future it's something that might make it in. I have a little update coming for the add-on, which should hopefully be out tomorrow. The functionality is done I just need to add the settings interface for it (which takes a while as I HATE doing it :P).